Available in the UK in April 2014. The first work by Eisner-nominated artist Nicolas de Crécy is the lyrical and hauntingly beautiful tale of a tormented opera singer. In order to curb the blood lust of Eccenihilo’ inhabitants, a big carnival is organized. 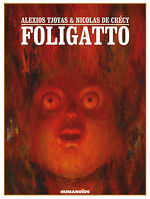 Its main attraction: the homecoming of the local golden child, the famous castrato opera singer Foligatto. The artist’s return to his roots, however, triggers a series of surreal events with reverberating consequences. From acclaimed creator Nicolas de Crécy ('The Celestial Bibendum', NBM’s 'Salvatore' series, 'Glacial Period'). I would describe this book as grotesquely beautiful. Foligatto is a comic that isn't afraid to reach a place not yet seen in comics before.